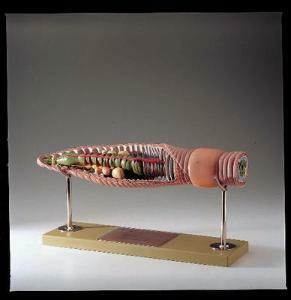 Lumbricus terrestris - the earthworm - enlarged 25x, in ‘SOMSO-Plast’. The model shows the front third of the body with a cross section in relief. To see the inside of the stomach the intestine can be removed, also exposing all the sexual organs. Finally the seminal vesicles can be removed to show the testes and funnels of sperm ducts. Separates into 3 parts, on a stand with base and explanatory notes. H25 cm, W53 cm, D14 cm, Wt 2.2 kg.